So...this is the Gator I wanted....but Scott didn't want to spend the money so I got Luke the battery operated version for his birthday instead! This thing is awesome!! There is a "governor" blocking the boys from second gear because it goes too fast! It has a real lift-up dump bed so after we break it in here at Wildwood, we'll put the boys to work picking up sticks for Grandma at the farm. Marshall wakes up asking to drive it. I had to pull him out of it kicking and screaming today as he was insisting he could drive it to the farm! (5.8 miles from here!) 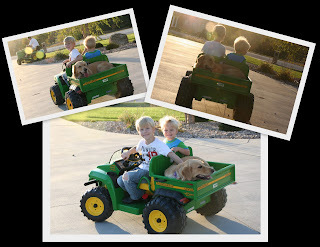 So far, Luke is being a very safe driver just like his Daddy....although Daisy does exceed the dump bed weight limit.